Draws a cylinder, and a cone, which is a special case cylinder. Definition at line 64 of file llcylinder.h. Definition at line 63 of file llcylinder.h. Referenced by LLCone::render(), and LLCone::renderface(). Definition at line 62 of file llcylinder.h. Definition at line 42 of file llcylinder.h. Definition at line 41 of file llcylinder.h. Definition at line 46 of file llcylinder.cpp. Referenced by LLViewerWindow::initGLDefaults(), LLManipTranslate::renderArrow(), and LLViewerWindow::stopGL(). Definition at line 45 of file llcylinder.cpp. 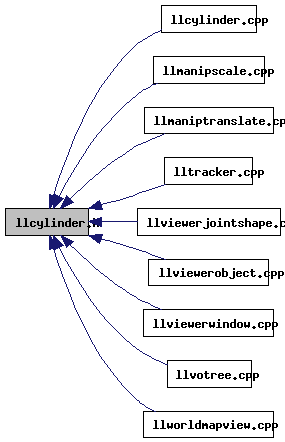 Referenced by LLViewerJointShape::drawShape(), LLViewerWindow::initGLDefaults(), and LLViewerWindow::stopGL().